Music is a very important part of our homeschool. When I met my husband I expressed the interest in having a piano in our home and learning to play. About seven years into our marriage my sweet husband surprised me with a full sized keyboard for Christmas. I started formal lessons after that and about five months later we purchased a beautiful new upright piano. 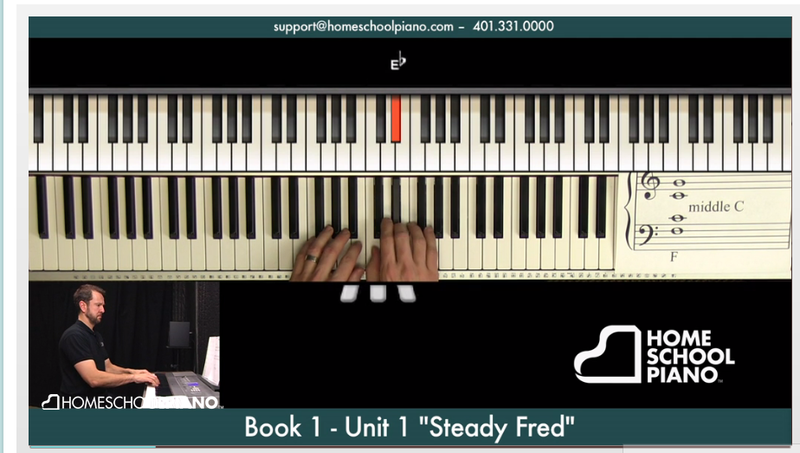 For this review I received a lifetime subscription for up to 5 students to HomeSchoolPiano - Complete Set of Books. There are printable books to go along with the lessons. Each lesson looks like the above picture. You see the instructor in the bottom left. In the middle is the keyboard he is working on and you can see his hands as he plays. On the top is a reference keyboard with lighted keys. I really like how this visual is. Not only do you hear your instructor speaking you also see all that he is doing. The Success Package is $299 and includes life-time access to the HomeSchoolPiano with all bonuses (downloads, jam tracks and sheet music.) Good for up to 5 students. The second option is a Payment Plan where you pay $99.97 per month for 3 months. Everything in the Success Package is included in this package the only difference is the option to make payments. You will need a few things to successfully implement this course. A full sized keyboard with at least 41 keys or a piano. You will also need a computer or tablet that can play the videos. A printer to print the books will be helpful as well. Both of my bigger boys (13, 12) have taken formal lessons for a few years. I too have taken lessons but that was many years ago. All of us play at advanced beginner-Intermediate level. The best way for us to do the lessons was for the big boys to sit down together to watch the videos. This way I didn't have kids taking up the computer all day to get in their lessons. When it came to a quiz we just let whoever was logged on take the quiz then they logged out and the other kid took theirs. We watched at our stationary PC and then moved to the piano for practice. I think in the future we will set my son's tablet up at the computer and see how that works. With both kids watching I thought that would be a problem for them to each sit at the piano bench (fighting or fidgeting on the bench) so they just pulled chairs up to my computer. We often did more than one video because a lot of this was review for us. The kids were happy to sit for about 30 minutes so it was a few lessons each time. I have a feeling as we progress one lesson will be all they will handle when it comes to having to practice more. I mentioned before that we've taken formal lessons in the past. We have been on a break this summer and will most likely resume in the fall again. (Our piano teacher is like family and we miss her!) The main reason we wanted to be part of this review because HomeSchoolPiano has a heavy emphasis on learning improvisation. Both my kids have what I call a natural ear and like to make up songs at the piano. They try to figure out songs they have heard as well. I knew this would be a fun course for them and it was. As for practice. My kids always practice any where from 10-20 minutes a day so that stayed the same. After a lesson they would practice from the printables - taking turns - sometimes with all of us working together cheering each other on! That part really wasn't a big deal - in fact - it is hard for me to get them to NOT play! They would play all day and night if I let them! I can only listen to the theme song to Star Wars so many times a day before I reach my limit though! I liked this program. I found Willie to be informative and encouraging. I like the format and how you could see everything on screen. I think it is a great substitution for lessons with a music teacher. You won't get the feed back you would with a person to person teacher but Willie gives so many encouraging words that I still feel like he manages to make it feel personal. I think something I could have done differently was have a set lesson time and set practice time. It is summer and we are more laid back with school since I consider all we do right now enrichment and not full-on school time. We took our lessons slow and are in Book 1 still. I wanted to start at the beginning to see how Willie taught. I think this worked well because we only skipped a bit in CorePiano. The kids had a lot of refreshers which was perfect because we had some time off from when we last took lessons. They both enjoyed their lessons and will continue to move forward this summer.